Print the template of your choice (below). Cut out the template pieces. 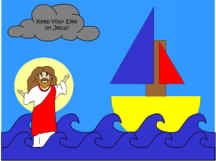 I've added a circle shape (halo) behind Jesus' head and arms to make it easier for the children to cut out. Cut out the pieces along the SOLID lines (adult assistance may be required). Set the pieces out in front of the child. Spend a bit of time talking about them (colours, shapes, sizes). Ask the child to pick up the circle (don't give it to them, let them have the chance to pick out the correct shape). Ask the child to fold the circle in HALF (you may want to have your own circle so you can do it at the same time... Children learn a lot by copying what we do). Once that is done, reiterate that they now have HALF a circle. Glue the half circle together. Do the same thing with both triangles and the rectangle. Glue the larger strip of waves to the bottom of the paper. Slip the straw through the slit. Once we glue the second waves over top, the Jesus figure will be able to walk along the water. Put a rolled up piece of masking tape on the back of the project, under the drinking straw, to hold it in place when you aren't using it as a puppet. You can trim the straw a bit shorter if you like. the light blue line shows where you would cut the slit in the paper. Glue the second set of waves over top, so it's lined up with the bottom. Just put the glue in a thin line on the very bottom of this piece so you don't glue over the puppet slit.